Muthanga Wildlife Sanctuary lies in Wayanad district of Kerala bordering the Bandipur NP in Mysore district of Karnataka. Also called as Wayanad Life Sanctuary, Muthanga WLS belongs to the Nilgiri biosphere. Muthanga WLS hosts a wide variety of animals like elephants, deer, lepoards etc. The National Highway 212 connecting Kozhikode to Mysore passess through the sanctuary. Often herbivores including elephants can be spotted on the road side. The Forest department provides facilities for wildlife safaries inside the sanctuary. The Ponkuzhi temple is near to the Muthanga WLS. Best time to visit Muthanga Wildlife Sanctuary is during the post monsoon months of October to April. Good hotels suiting any budgets are available at Sulthan Bathery (20km away). 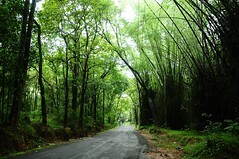 Many resorts are available throughout the Wayanad district. Muthanga WLS is 230km from Bangalore. Route 1: Bangalore - Mysore - Nanjangudu - Gundelpet - Muthanga WLS. KeralaSRTC and KarnatakaSRTC runs direct buses from Bangalore to Wayanad which passess through Muthanga WLS. One can also reach Sulthan Bathery by direct KeralaSRTC and KarnatakaSRTC buses from Bangalore. From Sulthan Bathery KeralaSRTC and private buses are available to Muthanga.